Product Dimensions: 8" x 12". 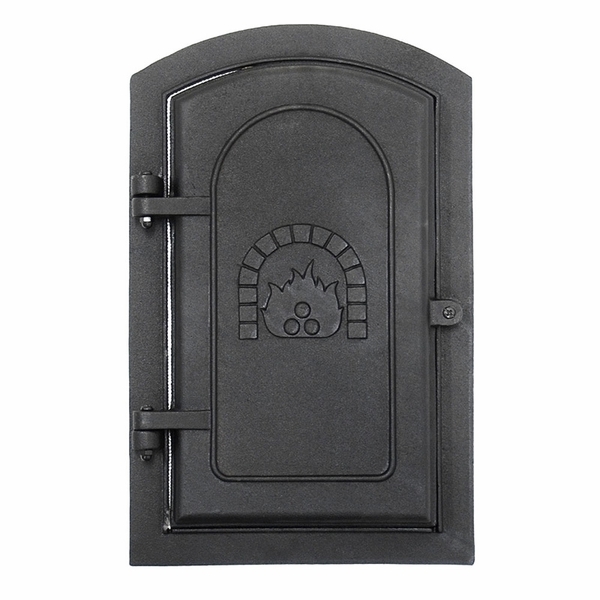 Outside: 11" x 17 1/2"
Our clean out doors are manufactured with the highest quality cast iron. You will not find a better quality door for your woodstove needs. These doors are very durable, with air tight fiberglass gaskets that keep the heat inside the stove. A single-bolt closure on the hinged door is specifically designed for easy operation and safety. You can also purchase optional heat insulating kits, if you so desire. The inside door dimensions are 8 x 12 inches. Outside door dimensions are 11 x 17.5 inches. Shop here for all your wood burning accessories. We offer great quality manufactured wood stove parts. I purchased this product for an older home that I?m redoing, and it is absolutely wonderful. Very solidly constructed. This product fits and looks amazing on our chimney! I give this product five stars, and am very happy with it. My family was in need of a good clean out for our older chimney. This door fits fantastically. It?s the perfect size, and you can just tell that it?s been built very well. Installation was also a cinch and didn?t take much time at all. I do recommend painting it with some paint to keep the rust way, especially if you will be using it outdoors like we do. We?re so happy with this clean out door that we are recommending it to everyone! It?s a great buy and an amazing value. I?m so happy with this door. It?s just as I had imagined ? well made, beautifully designed. It has already been painted black, but I am going to add another few coats to keep the rust to a minimum. This door is of a much higher quality than the ones I have priced at my local store. The screws aren?t a problem for me either. I highly recommend this door. I will never be calling the chimney sweepers again thanks to this product, and I couldn?t be happier! They were going to charge me $175 to replace my old one, but I did my research, and would not go for that. This product is superior and fits wonderfully. I decided to purchase a total of two cleanout doors to replace some from the basement that were very old and outdated, and weren?t functioning as well as they once did. These look amazing! I did use some machine oil to rub on the surface, which made them look even better. Installation was super simple, and they only use four screws, so the process didn?t take long at all. I created a seal with some cement caulk, and hopefully it was last and remain tight. I also used some weather strip to keep the unit as air tight as possible. Overall, I?m very pleased with both of these. This product was very simple to get installed, and it looks just perfect! It is definitely well constructed and a good value for the money. Although this door looks great and seems to be constructed well, I don?t believe that it?s worth its cost. I?m disappointed with the fiberglass gasket, which seems like it wasn?t installed very well. The door is almost impossible to get closed. We are very pleased with our purchase, and would most definitely recommend this product to others. It has met and exceeded all of our expectations, and has a great finish. This chimney clean out door is made from cast iron, and is nice, sturdy, and heavy duty. It?s been constructed solidly, and will work great to replace my older one. I am a little disappointed that there is no door seal with this product. Other than that, it is a solidly made, great looking product. This is a really good looking door that is super heavy duty and high quality. The door?s measurements are just as they are listed online. The door?s only flaw that I?ve noticed so far is that its screws are a tad long. I had to cut them down some before grouting. This is a very nice and attractive door that is made of cast iron. It?s sturdy and durable, and looks amazing on the exterior of our home. The screws look a little cheaply made, and they may be rusting some already. I will most likely replace the screws fairly soon. We originally purchased this product a few years ago, and it?s still looking great. We have repainted it a few times though. For the price, this is a great value. We had initially purchased a different model, and ended up returning because of its low quality. This one, however, is a really nice product. It looks great, is very sturdy, and provides a nice, tight seal. This is a really fantastic door! It looks very rugged, and I?m sure it will last for a very long time. Installing it was very easy, but I do wish that there was a gasket included to keep the air leaks to a minimum. I have taken it upon myself to seal up the small gap between the door frame and its block with some caulk, which seems to be helping so far. I got an amazing deal on this product, and the quality is outstanding. I do wish it was packaged a bit more carefully, but other than that, I?m completely satisfied. I have been searching for a while for a good chimney clean out door that looks good and doesn?t cost an arm and a leg. This one fit the bill just perfectly. It looks great on our chimney too. Sadly, it did begin showing some signs of rust after just a few days, but I expected that. We Love Our New Clean Out Door! My husband has been building a new chimney for our wood burning furnace, and we?ve been searching everywhere for a door for it. This door is just what we needed. It looks both durable and seems like it will hold up great to the elements.